In the framework of the official visit to Germany, on January 31, RA Prime Minister Nikol Pashinyan had a working dinner with the members of Bundestag’s Germany-South Caucasus Parliamentary Friendship Group. Representatives from the German Chancellor’s Office and the Ministry of Foreign Affairs of the Federal Republic of Germany attended the meeting. In his greeting remarks, Prime Minister Pashinyan noted that the dynamic development of the Armenian-German cooperation is one of the priorities of Armenia’s foreign policy, and the inter-parliamentary relations stand high on the bilateral agenda. 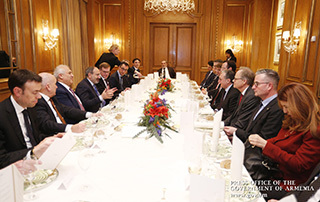 In this context, the head of the Armenian government highlighted the active contacts with German parliamentarians. Issues related to the development of Armenian-German cooperation, strengthening of inter-parliamentary ties, EU-Armenia partnership, as well as the ongoing democratic transformations in our country were discussed during the meeting.